According to the reports, Conor McGregor will fight one more time before the end of this year. The information was shared by the outspoken former UFC middleweight Chael Sonnen. The comments of Sonnen are it anything could not be taken lightly. He is liable to speak about anything and it will make the headlines but, to be fair, in the past, he has been correct as well, as he has some sources in the UFC whom he quotes often when the great success come in for him. Sonnen covered the lucrative boxing debut of Conor McGregor against Floyd Mayweather for ESPN recently and he claims to have information from inside about who will be the next in line for the champion of UFC lightweight. 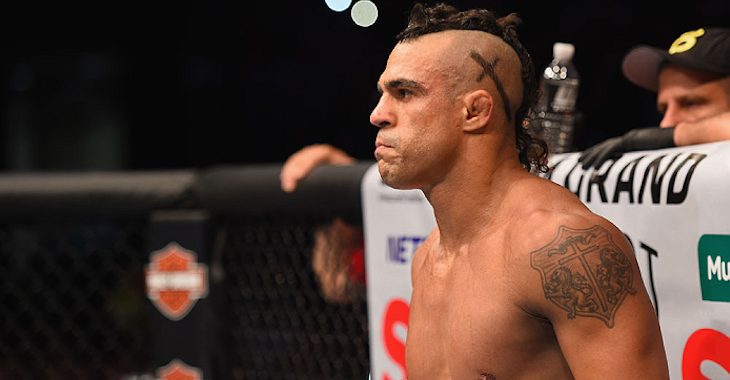 According to the original plan, Vitor Belfort, MMA legend was to take on Nate Marquardt on June 3, the main card of UFC 212,in a fight that will go down as the last of his legendary career. However, it seems his fighting days are far from over. Recent reports has it that since the announcement of his retirement fight with Marquardt, Belfort has backtracked on his retirement fights. His current position now suggests that even though this might be his last fight in the UFC, it would not be his last overall. After making the necessary clarifications on the circumstances surrounding his upcoming fight with Marquardt, Gustavo Lacerda, Belfort’s manager who spoke to the MMA Ganhador podcast has offered up even more information. The Ex-UFC star Chael Sonnen has let out an entertaining side behind the scene story about his fellow boxer Floyd Mayweather before he suddenly gained fame. The 39-year-old fighter narrated the story about how Mayweather behaved in the dressing room one time in a bout in Orgeon (where Sonnen is from) when Sonnen had been working for the Athletic commission in the State one night, supervising hand wrapping and the like. One of the greatest – and most controversial – names in MMA comes out of his retirement. The Associated Press revealed late Thursday that Chael Sonnen (28-14-1 MMA, 0-0 BMMA) would get back into action for the first time since Nov. 16, 2013, after agreeing to a multiyear, multi-fight contract with Bellator. The promotion later verified the news, saying Sonnen is going to contend in its light heavyweight division. While he was in the UFC, Sonnen twice fought for the middleweight trophy, losing twice to then-champ Anderson Silva, and also fought for the 205-pound title then retained by Jon Jones. He ended up losing all three fights by stoppage. Chael Sonnen and Georges St-Pierre are two famous fighters of the UFC who have not competed inside the Octagon since 2013, but there has been news that one or both of them could make an entry to the cage soon by this year. St-Pierre, who is 35 years old, had taken an indefinite leave from UFC soon after he defended his welterweight title from Johny Hendricks. However, the rumor about his comeback has brought a whole lot of excitement and anticipation in recent months. As far as Chael Sonnen is concerned, his comeback will certainly bring some life in the game of UFC. If he decides to come back, he will certainly gather some of his opponents and the prominent one is the former welterweight champion. Sonnen narrated an incident which took place while he was in Los Angeles. He received a call from Kenny Florian asking if he was interested to work out with Georges. As they started working out together, Sonnen realized that he could have performed better. 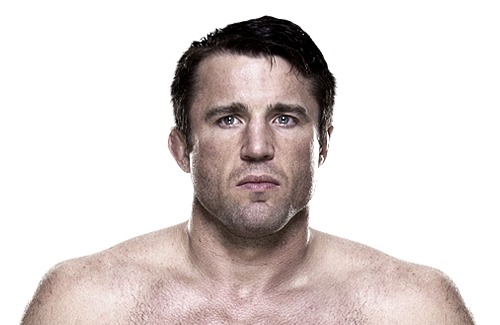 Sonnen has played in the light heavyweight division of the UFC and is a retired martial artist. The middleweight contender of UFC Chael Sonnen, who made his debut in UFC against the former light heavyweight fighter Renato Sobral at UFC 55, is known for his excellent wrestling skills. This happily married American mixed martial athlete last competed in the Ultimate Fighting Championship in the light heavyweight division. He has done well as a coach and has always supported his fighters. The recent argument with John Kavanagh, who is the head coach for McGregor, is the best example that proves how supportive and defensive he can get when his fighters are targeted. Former Ultimate Fighting Championship or the UFC fighter Chael Sonnen, like most fans, was looking forward to the return of Brock Lesnar to the Octagon after four years away from the promotion and like any other fan; he was also left disappointed when Lesnar announced a renewal of his contract with the World Wrestling Entertainment (WWE). But the American is not willing to close the door on his return to the UFC for good. But Sonnen also said that he completely understood what Lesnar meant when he said that his legacy inside the cage in the UFC was over. The American is currently working as an analyst for the UFC and Chael Sonnen feels that the comments made by Lesnar was pretty obvious in nature – he tried his best to make it feel as if he was ready to return to fighting again competitively. To say Wanderlei Silva and Chael Sonnen were close friends would be a slight exaggeration. By almost all accounts, the two had been the worst of enemies throughout their stints in the Ultimate Fighting Championship or the UFC. The two were scheduled to fight at UFC 175 to put to bed the long standing feud but a failed drugs test from the American and the Brazilian’s reluctance to take the drugs test meant that it wasn’t meant to be. Chael Sonnen is as good a MMA fighter as he is a talker. It is no doubt that he was in the top most middleweight person of the year. In the recent years he has taken the troll to yet another level. In 2013 before the fight between him and Jon Jones he had guessed that Jones was taking in cocaine. Former Ultimate Fighting Championship or UFC Middleweight champion Anderson Silva is widely regarded as the greatest fighter in the history of Mixed Martial Arts and the top pound for pound fighter, but according to his one time nemesis, the Brazilian is not as good as the UFC has people believe. Chael Sonnen, who suffered two consecutive defeats at the hands of the Brazilian believes former UFC Welterweight champion Georges St. Pierre is a more complete fighter as well as the better athlete when compared to The Spider. And the American Gangster says he talks from experience when he makes the comparison and as a result, he is the best person to make a judgement. Sonnen was speaking to Nate Diaz in a talk show as the UFC builds up to the Nick Diaz v/s Anderson Silva fight at UFC 183 in January, 2015 where he said that he has fought with Anderson Silva twice and he has worked with Rush as well and he had a much tougher time against the Canadian than the Brazilian. Chael Sonnen said that was his own experience, adding that he knows style and swagger do make their way into the comparison but in terms of pure athleticism and talent, Rush was far superior compared to Anderson. He told Nate Diaz that he believes his brother has been in fights that have been a lot tougher and he doesn’t think Nick Diaz will realize that a few minutes into the fight. 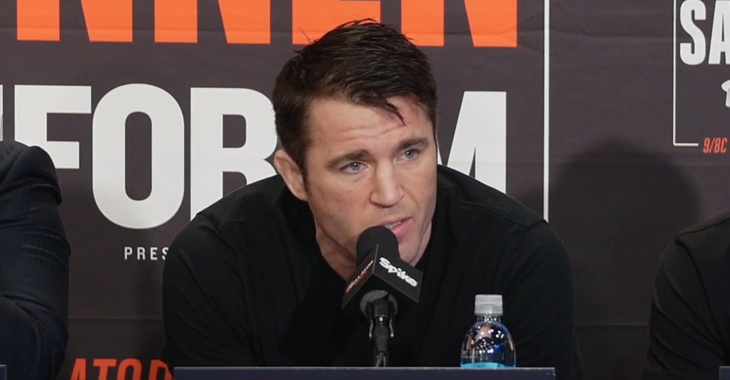 But Chael Sonnen reiterated again that Silva is very good and his comments are in, no way, meant to be derogatory towards him, but he is just not as good as the UFC has people believe. The American said that Nick Diaz has a good chance of beating Anderson especially now that he is coming back from injury and is not in prime condition.